I am totally absorted with my renewal work in another website (about Poland, if you are interested, although it is in Spanish), and I am planing to write up some articles for this blog about basic structural geology. Perhaps I should say "not so basic stuff but something we should have always in mind". And something I have realised now is that I totally forgot to post here the creation, some months ago, of a "Structural geology and tectonics" group in Facebook. Raik and I are the administrators of the group. If you are an user of this social network (you are in another planet, or perhaps you are still resisting to join it... now is the moment to do it! ), you are invited, encouraged, to join us there. 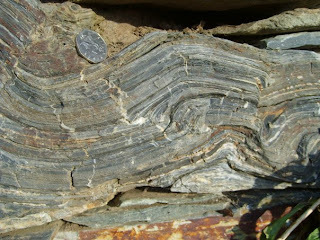 I wonder how I can do a more direct link between this blog and the group, but first things first: writing about geology!